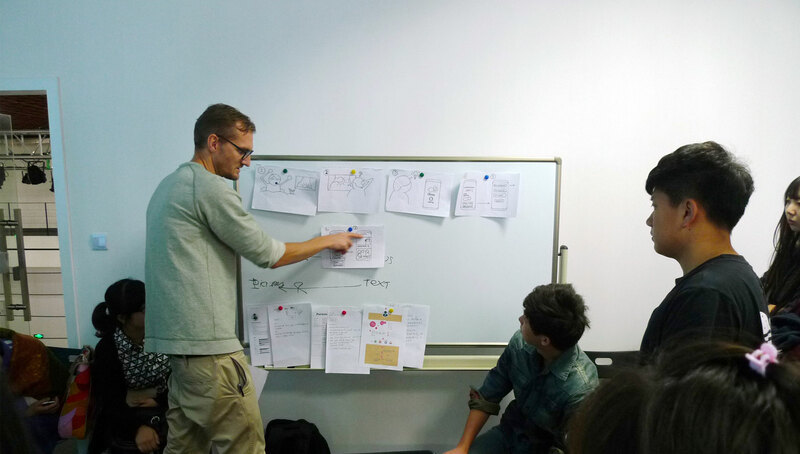 Teaching design sprints at South China Normal University. Iwas asked to teach a UX course along with my colleague Weiming Fan by the faculty of SCNU. Being unsure of the level of the students, Fan and myself decided to teach a very basic 5 day sprint, teaching both methodology and skills to cover concept, user testing, iteration and prototyping, and adjusting the skill level to the students as we discovered where the students weaknesses lay. The design sprint methodology is one that we frequently employ at the BBC. Realising upon arrival that the students had little experience in UI and UX design, we quickly decided that the course should form a sort of introduction to UX while also giving them a basic skill set and methodology that they could repeat on their own. Further, we faced a significant language barrier. Through trial and error, we learnt that a combination of drawing and translation allowed us to create an environment where we could both critique and teach in a manner that relied less on verbal communication. Day 1: interviewing users to discover needs plus basic ideation techniques. Day 2: Scenario making, paper prototyping and basic user testing. Day 3: high fidelity prototyping, using simple prototyping tools like Keynote. Day 5: Presentations and final crits. Each day started with a short lecture on the subject of the day, leaving the remainder of the day for the students to work and Fan and myself to support and critique. Below are a couple of videos, displaying the final results of a productive 5 days. Given that this was the first time the students were wrestling with creating digital products, Fan and myself are very proud of their output. Set in Effra by Dalton Mag & Garamond Premier Pro by Robert Slimbach. Permanently in beta as I learn how to code.